When my daughter started school I was concerned about her being too "young." Her birthday is September 25, and the cut-off date to start kindergarten was October 1. Her teacher assured me after the first month that she was ready. However, first grade was a different story, as it is for many children. My daughter found it difficult to get into the routine of doing homework. I was also surprised that she showed so little interest in learning to read, as both my husband and I are avid readers. At the first parent-teacher meeting, her teacher assured me that my daughter was doing fine and that reading required developing a lot of skills simultaneously. Still I wondered about the amount of resistance I was encountering. She was learning, but there seemed to be little motivation. One day as I was walking back from my daughter's school with another mother, Mary, I asked her how her daughter was managing with reading. Her daughter, who is in the same grade as my daughter, had no difficulties with reading, or with doing her homework. Out of curiosity, I asked her when her daughter was born and discovered that her birthday was in January. In other words, although our kids were in the same grade, Mary's daughter was nearly 10 months older than mine. 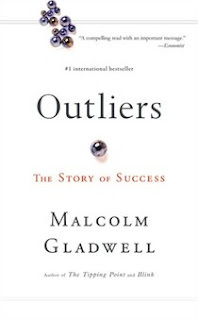 It was around this time that I picked up Malcolm Gladwell's Outliers: the Story of Success. Although a very insightful book, I found little to allay my fears about having enrolled my daughter in school before I was convinced she was ready. In his book, Gladwell looks into the different factors that influence success and make the outlier, or someone who does things out of the ordinary. In the first chapter, the author looks at successful hockey players and the months in which they are born. Given that the cut-off date for hockey registration in Canada is January 1, it was not surprising that young boys born in January, the oldest, would be the biggest and have slightly more skill than boys born later in the year in the same age group. (Sorry, Mr. Gladwell did not mention girl hockey players in his book, as he should have.) He looked at semi-professional hockey players and found that a high percentage of team members were born in the first three months of the year, a pattern which was repeated in other countries. Now, you might be asking yourself how could being born in the first three months of the year make that much of a difference? Gladwell claims that success is what sociologists dub the "accumulative advantage," and he uses the example of the successful hockey player to illustrate. The professional hockey player starts out a little bit better than his peers, and that little difference leads to an opportunity that makes that difference a bit bigger, and that edge in turn leads to another opportunity, which makes the initial difference bigger still- and on and on until the hockey player is a genuine outlier. In other words, the small initial edge, in terms of age, size and skill, leads to more opportunity or more hockey games and better coaches, and the individual gets better and better. I think you can see where I'm going with this. I immediately felt that I was wrong to have enrolled my daughter in school when I wasn't convinced she was ready. Admittedly, there isn't much I can do now. She has her friends and seems very happy where she is. I guess all I can do as a parent is be on the look-out for those opportunities that will help her along the way. : Accumulative Advantage: Something to Consider For Your ChildrenTweet this! A friend had just recommended that book to me. How weird. Now I really need to read it. My daughter's birthday is in September, and the k cutoff at our school is December, so I was worried she'd be behind. I hemmed and hawed about whether to hold her back a year. In the end, I didn't. She didn't read as soon as her brother (who is a March baby) did, and I wondered if I made the right decision. But remember: You're an involved mom who cares about your child. That gives her a huge edge compared to many kids, who unfortunately don't have that situation. I'm writing this almost four years after writing this post, and I'm still seeing the same pattern with my daughter. At the beginning of the year, my daughter doesn't do very well, and by the end of the year (3rd semester), she's well above average. I attribute this to a lack of maturity because she's definitely brighter than average (this comes from my experience as a public school teacher and not my parental pride).